With UK interest rates close to zero, who benefits from low-interest rates? Savers will get lower interest payments on their savings. Borrowers, especially mortgage owners will see lower interest payments on their debt, increasing discretionary income. 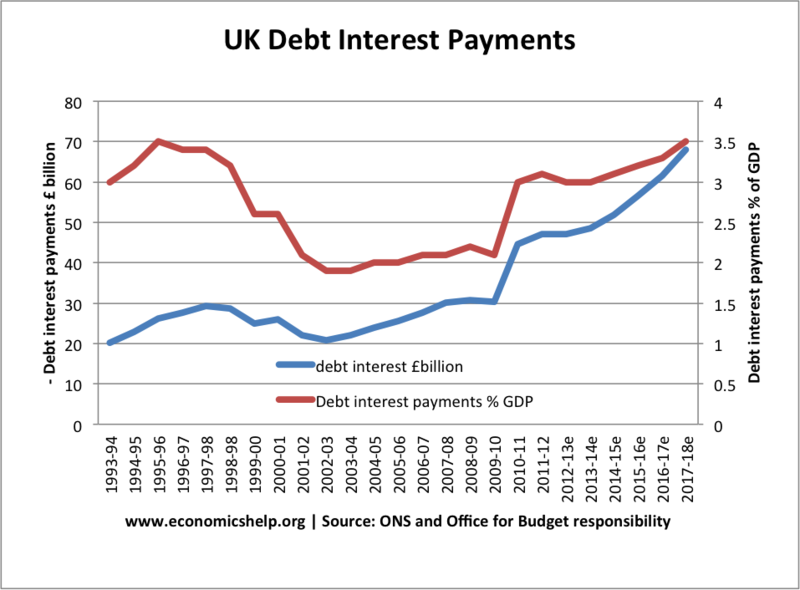 The government can borrow from the private sector at a lower interest rate, reducing interest costs on public sector debt. Banks find it harder to be profitable and attract deposits. This can adversely affect the quantity of loans. Therefore, although it is cheap to borrow, in practice it may be hard to get the necessary finance. The currency tends to fall, which is good news for exporters – bad news for importers. 1. Mortgage holders. 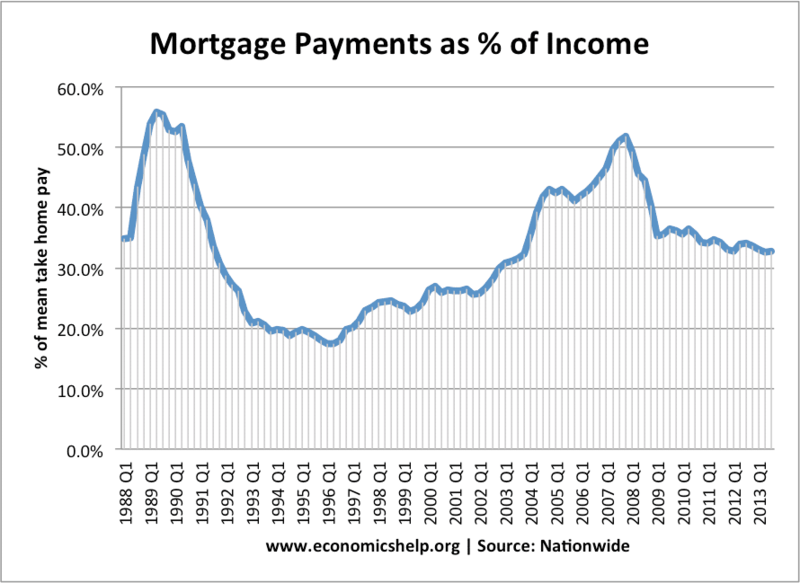 With record UK house prices, mortgage interest payments are, for many, the largest part of their disposable income. A small cut in interest rates can lead to lower mortgage interest payments and more discretionary income to spend. Lower interest rates have helped reduce mortgage payments as a % of mean take-home pay- despite the rise in real house prices. 2. Firms and consumers wishing to borrow. The biggest fall in lending interest rates have been for those seeking an unsecured loan of 10k from a bank or building society (B of E key: IUMHPTL). Loan rates have fallen from 10% at the height of the crisis to just over 4%. This makes it cheaper to borrow for purchasing large items. Business lending rates have also fallen, reducing the cost of investment. 3. Government debt payments. The fall in interest rates and global insecurity has seen a fall in bond yields (the rate at which the government borrows). 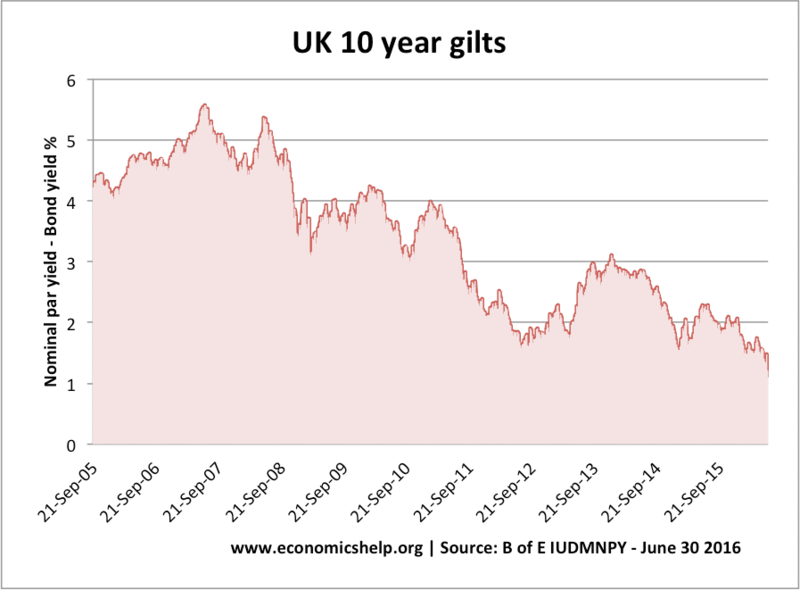 The interest rate on many short-term gilts has become negative. The interest rate on 10-year bonds has fallen. This fall in bond yields is occurring, despite a rise in government debt to GDP, and a persistent budget deficit. It is important for limiting the percentage of tax revenue spent on debt interest payments. Investment. In theory, falling interest rates make investment more attractive. The government can borrow to invest in infrastructure. With very low-interest rates, investment projects can easily pay for themselves. Firms wishing to borrow in increasing capacity will also see lower costs of borrowing, giving potential for better rates of return. Exporters. If UK interest rates were to fall below the Eurozone and US, then this would make it less attractive to save in the UK; therefore, we would see an outflow of ‘hot money’ and a further depreciation in the Pound Sterling. This would make exports relatively more competitive. This would benefit exporting firms, especially if they wanted to borrow to finance investment. 1. Savers. The most obvious losers from low-interest rates are savers. 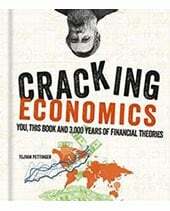 This is particularly the case for people who have planned to rely on the income from interest payments and dividends. The cost of low-interest rates becomes greater if inflation is above the interest rate. With inflation above saving rates, it means savers see a real fall in the value of their savings. Pensioners have benefited from the triple lock guarantee which has seen a rise in the real value of state pensions at a time of stagnant real wages. 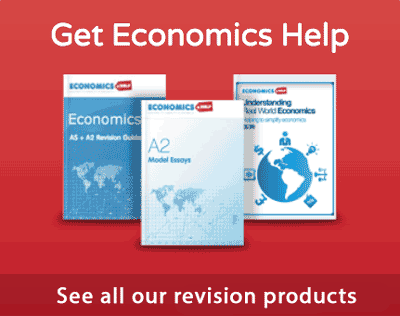 Although savers gain lower income, the aim of low-interest rates is to avoid recession and unemployment – which is potentially a much bigger cost to young workers affected by unemployment. The problem with low-interest rates is that it can make it harder for commercial banks to be profitable. Commercial banks rely on lending at a premium to saving rates. In normal times, banks may attract deposits at say 3%, and lend out at 6%. This interest rate differential could be seen as a rough approximation at a profit margin. 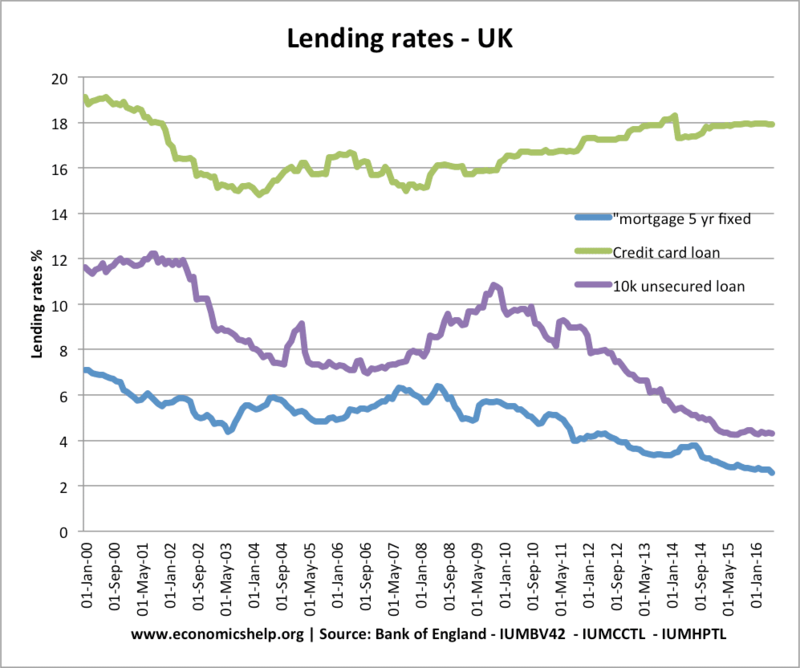 However, with lending rates falling, this has squeezed the profitability of banks. 3. Borrowers who face lack of credit. 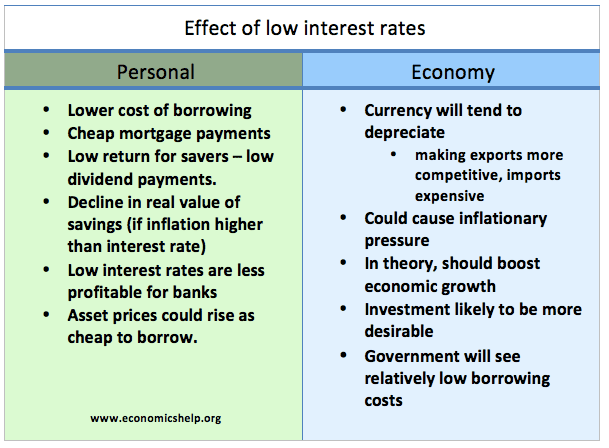 Lower interest rates are not necessarily all good news for firms and consumers who wish to borrow. The problem is that ultra-low interest rates can make banks reluctant to lend because they lack deposits and find it unattractive to lend. 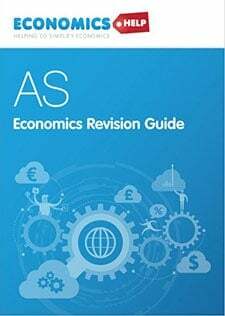 For example, building societies which rely on savers to deposit money may find with interest rates at zero, people keep hold of money or seek better yield returns. Therefore, building societies become short of funds to lend. 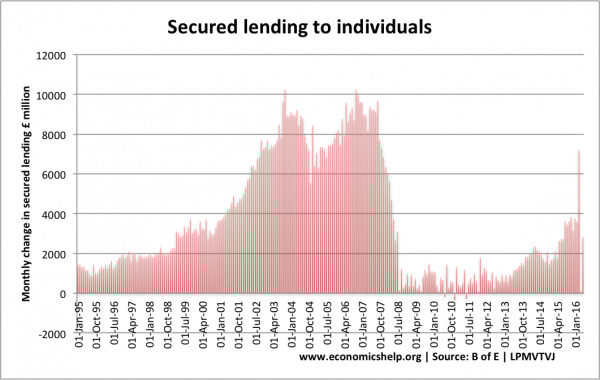 Secured lending to individuals has fallen since 2008 crisis. 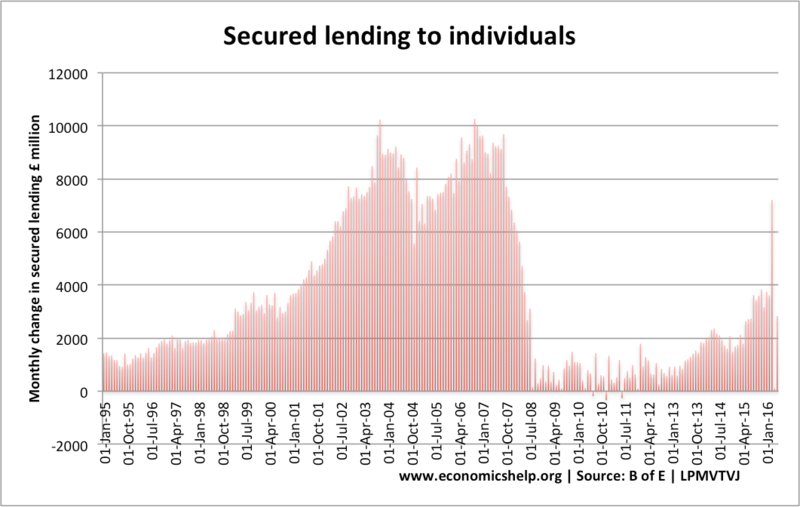 This shows that after the dramatic cut in interest rates of 2008/09, bank lending fell. Although it was cheap, firms found access to credit limited. A further interest rate cut in 2016, could hit bank lending again, just as it starts to recover. People who cannot buy a house because they are too expensive, will not benefit from the low-interest rates. Instead, they may argue that ultra-low interest rates are artificially inflating the housing market – leading to more profit for buy to let investors, but rising rent costs. The reasons is that in a period of ultra-low interest rates, investors look for better rates of return than normal investments so look to the real estate market. There are many factors pushing up house prices apart from low interest rates, but it shows not everyone benefits from low interest rates. Potential gain. If low-interest rates do their job of boosting economic growth, preventing recession and helping economic recovery. Then the net gain will mean the economy in a stronger position for everyone to gain from economic growth. However, seven years of ultra-low interest rates haven’t succeeded in returning the economy to normal growth, and now there are prospects of interest rates staying at zero for the foreseeable future. But, on the other hand, if interest rates hadn’t been ultra-low, the economy would be in an even worse situation, which may have forced more spending cuts and lower real wages. Falling borrowing rates for mortgages and personal bank loans benefit those customers (who tend to be more affluent). However, the fall in base rates has had no effect on credit card loan rates. Low interest rates tend to have less impact for low-income groups who are unlikely to have mortgages or personal loans, but rely on inferior forms of lending, such as payday loans and credit card loans. Given the deflationary pressures in the UK (and global economy), it is hard to see any alternative but to pursue a policy of low interest rates. 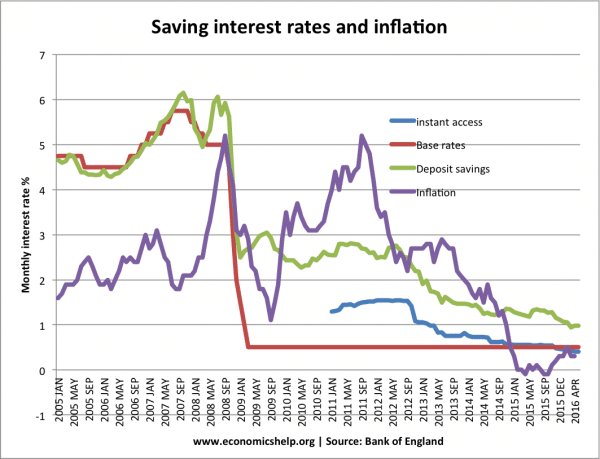 It would make no sense to keep interest rates high with the aim of increasing the returns on savings. However, the policy does have important distributional effects, which may require consideration. 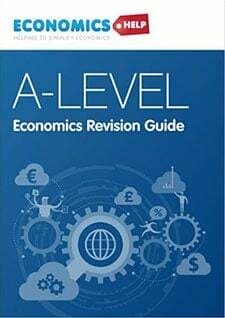 The Bank of England is primarily concerned with primary macroeconomic goals of economic growth, inflation and unemployment. 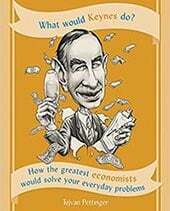 They can’t run monetary policy on the basis of micro-economic issues. Save all you can as inflation is a part of this global policy, no wage increases lowers the spending of the working class. Inflation comes because everyday goods are no longer produced and have to be imported, the creep of supermarket prices is barely visible but in time severely curbs working class ability to stay ahead. When mortgage crisis happens families are affected with splits occurring, meaning houses are sold and the rent demand increases as two houses are needed instead of one due to split families. Houses are snapped up by financialy Secure investors who charge high rents as income from banks is zero. The unseen affect is what happens to the children on a future society who have to live through the depressing, distressing family bust up. Marriage is no longer seen as an attractive aim. These policies are only implemented to serve the wealthy. Thank you so much! you have no idea how much this has helped you’re the best!!! The Australian situation seems similar with historic record low interest rates encouraging borrowing to buy real estate, particularly in Australia’s two largest cities, Sydney and Melbourne. There is some indication that low rates may be keeping unemployment under control but inflation remains below target. Those who invested in real estate in Melbourne and Sydney have definitely been the ‘winners’ but cash rich retirees the loosers. what the author forgot the mention is that near zero interest rates increase speculations. High earners need a place to invest their newly earned money, and therefore, with zero on CD, and very high stock valuations, and almost zero returns on bonds, they only have few limited options, which is to speculate on residential real estate. Stockholm, London, Oslo, Paris, Seattle, Portland, San Francisco, Boston, NYC, etc.. People are crowdfunding residential real estate development, therefore driving rents higher, which is mentioned in this article but not made clear. Speculators are making money now, when property prices are rising double digits year after year since the low of 2011. Soon, the bubble will burst, and this time it will the “real estate investors” that will be hurt. Zero interest rates will benefit the larger borrowers, like big companies buying other big companies for 10’s of billions, and of course governments funding social spending by ultra low interest rates. Both of these type of entities will eventually ran their course of pushing the can down for the next guy to deal with the problem, will eventually collapse.